CERTIFIED HORMONE- AND ANTIBIOTIC-FREE PROTEINS. Our Protein Cookies feature grass-fed proteins from healthy, happy, humanely treated, pasture-raised cows. Our hormone-free proteins come from dairy cows NOT treated with antibiotics or genetically engineered hormones (rBGH or rBST). TIME-RELEASED PROTEIN BLEND AND PREBIOTIC FIBER. Each delicious Protein Cookie packs 12 grams of the highest quality, time-released protein and 5 grams of gut-friendly fiber, including prebiotics, to help satisfy your sweet tooth AND your appetite. MADE WITH THE FINEST NATURAL INGREDIENTS. BioTrust Grass-Fed Protein Cookies are made with premium, natural ingredients. They are gluten-free and non-GMO, and they are FREE from soy protein and artificial sweeteners, flavors, colors, and preservatives. OUTRAGEOUSLY DELICIOUS AND NUTRITIOUS. 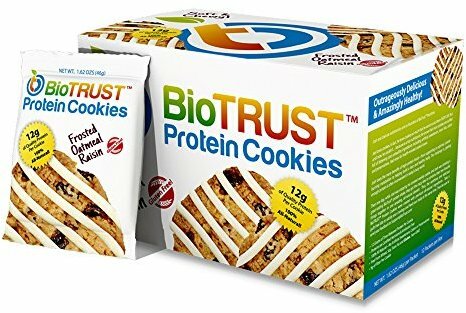 With over 500,000 boxes sold, BioTrust Grass-Fed Protein Cookies are a proven leader in taste, quality, and value. QUALITY GUARANTEE. At BioTrust, we are committed to being the best. BioTrust Grass-Fed Protein Cookies are manufactured in a GMP-certified facility and undergoes 3rd party lab testing to ensure purity, potency, safety, and your results. No artificial sweeteners, flavors, colors or preservatives added. Gluten-free and non-GMO.